Capitol Hill displays 100 luminaries in Statuary Hall: two donated from every state in the nation. Recall, Ms. Pelosi is a 30-year veteran of the House of Representatives. Has she forgotten she was in charge of that institution not so long ago? As the 52nd Speaker of the House, why didn’t she have the “offensive” Confederate figures populating her workplace removed? Wasn’t four years—from January 4, 2007 to January 3, 2011—enough time to purge the chamber of her “undesirables”? Correspondingly, Democrats had total control of the U.S. Senate for four months. A 60-member filibuster proof majority from September 24, 2009 until February 4, 2010. For context, in that small window there was ample time for them to pass Obamacare. Yet, on this matter, why were Democrats as mute and inactive then as the statues they now so vehemently object to? A shame unmentioned by anyone—but known by everyone—is an open historical secret. Ms. Pelosi’s violent bigots were her own political forebearers: antebellum Democrats. If those disreputable Southerners were not pro-slavery, why did they start the Civil War? Did they not also create the Ku Klux Klan to resist liberating Republicans, and intimidate their supporters? Furthermore, weren’t chastened Democrats still managing things on the ground after the Reconstruction in 1877? Did they not establish segregationist Jim Crow laws (as antithetical to Republicans as slavery) that finally went out of favor at the beginning of the civil rights movement of 1950? Certainly a cruel record they would like the informed to forget. Fortunately, conservatives—aptly represented by the GOP’s symbol of the elephant—have long memories. What’s understood is that liberals, regardless of the passage of time, have always been rabble-rousing troublemakers. Specifically, as they evaluate every circumstance through the superficial prism of race—aren’t they as identity obsessed, and polarizing, as their political ancestors? Each generation presents a clear and unmistakable threat to traditional American values. Therefore, in function, obstructionist Democrats (read: anti-Trump proponents) are simply the latest version of anti-Union Confederates. As an example, wasn’t West Virginia Sen. Robert C. Byrd—known as the “Exalted Cyclops” of the KKK—also a lifelong Democrat? In that regard, it’s interesting to note that Ms. Pelosi worked side by side with this former Klansman for 23 years. Thus, for decades, she was apparently untroubled by Mr. Byrd’s outspoken embodiment of racial prejudice. Why then should inanimate Confederate statues now provoke discomfort for her? So, solely on her say-so—via Democratic voodoo (one imagines some magical form of osmosis she has been immune to during her lengthy Congressional career)—Republicans have secretly been infected by pro-KKK attitudes? Specifically, Republicans should be condemned for not doing what she never has—and brought up for the first time last week? This Democratic leader has certainly mastered the art of hypocrisy! In truth, her ridiculous assertion contradicts the GOP’s founding principle of abolitionism! From its inception in 1854, Republicans have repeatedly championed equal rights for all. Thus, only dupes would heed this Johnny-come-lately to anti-Confederacy sentiment. Likewise, Ms. Pelosi’s hollow claim to value honor is yet another polarizing stunt. It’s neither Republicans nor Confederate statues that’s contemptible here! Pelosi’s “dangerous” assembly is a multicultural free speech rally by Patriot Prayer next Saturday at San Francisco’s Crissy Field. Since when is a gathering to express mainstream American tolerance something “hateful”? In any case, what Democrats care about here is cleansing the American landscape of physical mementos of their vile political past. Hence, their Confederate counterparts must go. In practice, when that occurs, progressives ensure the innocent right wing is blamed for it; as well as any associated street violence (perpetrated by their fascist thugs). With the abetting MSM media in tow, Democrats’ propaganda is constantly reinforced. Their message is wrongly perceived by the low-information citizen as gospel. To subsist, responsibility-phobic Democrats habitually scapegoat others (read: “Trump Derangement Syndrome”). Thus, liberals’ latest fixation on imaginary Confederate ghosts is yet another subject-changing distraction from their own leftist tyranny. 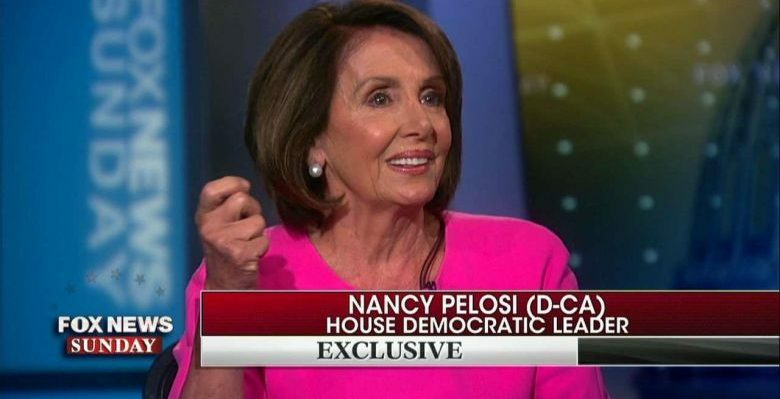 In the final analysis, how devious is Nancy Pelosi’s strategy: demonizing the defenseless dead while simultaneously defaming the reputations of Republicans as de facto 21st century collaborators! Yet, her wickedly revisionist narrative fails to hide the timeless cultural sins of her corrupt political party.